The Hozelock Auto Reel is without a doubt one of the best hoses available on the market. The innovative unit gets rid of the troublesome task of winding up lengths of hose, and makes easy work by automatically reeling it in for you. The hose can be locked into place while in use, so you don't have to fight against the winding mechanism while using it. An automatic brake is also included to stop the hose from retracting too quickly. You only have to read the customer reviews for this item to realise just how fantastic the Hozelock Auto Reel is. 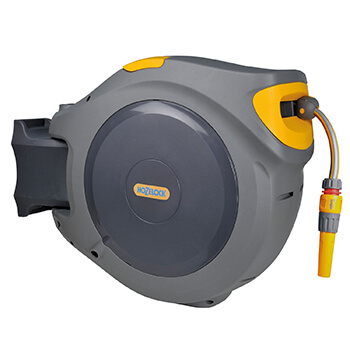 If you're fed up with having the hassle of winding hose back onto a reel, if you're sick of tripping up on hose that is tangled up on the floor, if your hose is constantly getting kinked or knotted, then this reel is the answer to your woes. 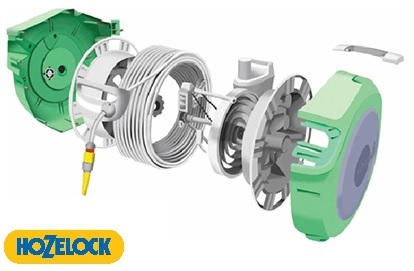 The 40m Auto Reel is the longest spring loaded hose system available from Hozelock. It is best known for its innovative ability to easily let out the perfect length of hose with minimal effort, and then automatically retracting it when you're done. Complete with Hozelock's anti-kink hose, the patented design means the pipe will coil itself back neatly, without tangling or knotting, and a built in automatic brake means it will not retract too quickly causing damage or injury. 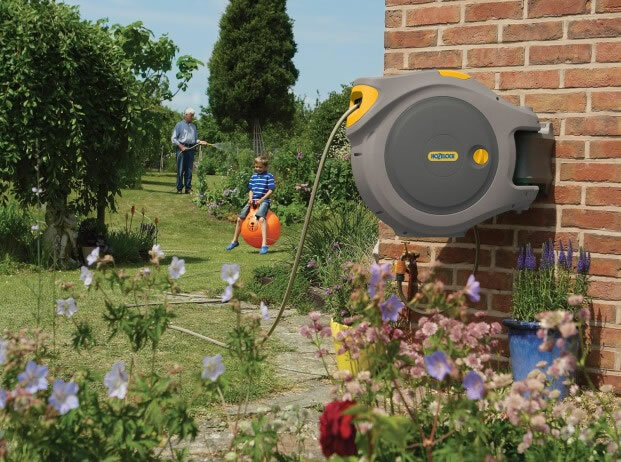 The Auto Reel has a hinged wall mount which easily pivots up to 180º to allow easy access to all areas of the garden, and gives the ability to fold the reel against the wall when not in use. A child lock and padlock function and also included, and an easy removal system allows the reel to be taken off the wall bracket for storage during winter months to prevent it from freezing. Lost your manual? Download a digital copy here! The Hozelock Auto Reel comes with a 5 year manufacturer's warranty included. For this to apply, you must register your purchase at Hozelock's Warranty page.